There are two basic categories of travelers; those who travel because of obligation and those who travel because they want to. Sure, someone can fall into both categories (think business tripper who would rather be on a plane than drinking alone while playing solitaire in his/her post-modern apartment) or none (think an over-dramamined passenger who ends up continuing onwards to Oslo by accident instead of getting off the plane in London). Although I have traveled by choice in aluminum tubes at unnatural speeds and heights, purposely rode in buses on frightening mountain roads, and made the decision to take boats up muddy Amazonian tributaries, I think I have most often fit into both categories. For example, when I took a four day bus trip with a friend of mine from Niagara Falls to western Mexico during the winter break of 98, we were dual category travelers; I wanted to go there but was obliged to take the bus because of my personal funding situation while my friend wanted to see Mexico and felt obliged to get away from arctic January Niagara. 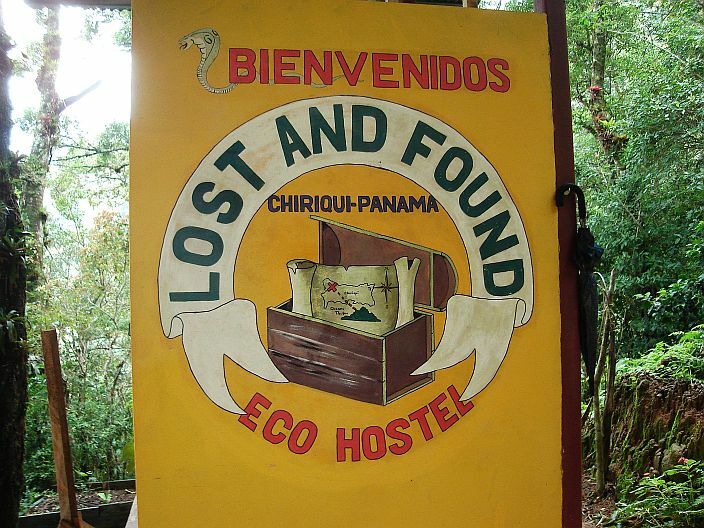 When I recently when to the Lost and Found eco-hostel in Chiriqui, Panama, I arrived as a traveler who not only wanted to stay there but also felt obliged to stay at an “eco-hostel”; a concept I have always dreamt of and hoped to see come to fruition. I had been intrigued again and again by their pamphlets at other Panamanian hostels; the Hospedaje Heike hostel in Bocas del Toro, Zuly’s Backpackers in Panama City and at the Purple House in David. Simple, photocopied pamphlets that told of a hostel nestled in cloud forest. I mean what a great deal!- affordable lodging shared with other like-minded travelers in beautiful mountain forest excellent for birding! Sounded like an ideal place to go for a border run; cheap lodging located in a natural setting. Somewhat in the middle of nowhere, it also sounded ideal for bird photography; nothing else to do, nowhere else to go but to concentrate on the birds. After some searching on the web I found their blog which had most of the information I needed including photos. I decided to contact the owners though because the directions seemed rather vague. 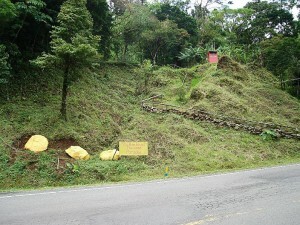 They were something like watch for the sign on the right just after the village of Valle de la Mina along the Chiriqui-Almirante road. Patrick and Andrew got back to me in a very timely manner and assured me that the quoted prices and directions were correct, so off I went! On July 30th, I left on the San Jose-David bus at 7:30 A.M. We were lucky with the weather and had a beautiful sunny ride up and over the high Talamanca mountains; home to Resplendent Quetzals, cold mornings and montane rain forest on Cerro de la Muerte. We made a few stops for bathroom breaks and lunch, arriving to the border around 1 P.M. Luckilly, things went quickly at the Paso Canoas border crossing that day with us back on the bus after only an hour and a half of waiting in lines, getting stamps and being confused. I spent the night in hot David at the Purple House Hostel (everything really is purple there!) and continued on to the Lost and Found Hostel the following day, arriving around noon (take the bus to Changuinola and get off when you see the yellow sign-about an hour out of David). Their directions are accurate; you really do have to keep an eye out for the yellow sign on the right hand side of the road just after the town of Valle de la Mina. It is obvious and says, “You have found the lost paradise” but you could miss it if you weren’t watching for it. From the sign, it’s a pretty steep walk uphill to the hostel; ideal for going slow and taking in the beautiful surroundings. The climb is worth it because as far as hostels go, this is a really good one. 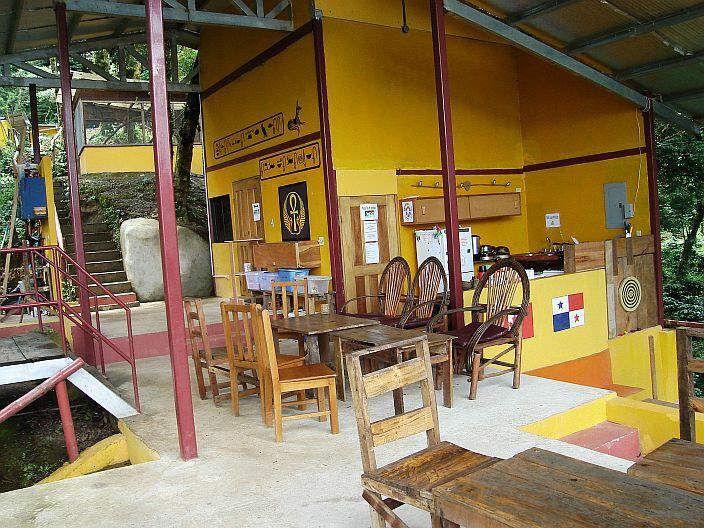 The beds are huge, dormitories spacious, hot water showers, food and drinks are available for purchase (can also bring your own- much cheaper), cool outdoor area for eating and hanging out, awesome mountain scenery, and trails through primary rain and cloud forest. 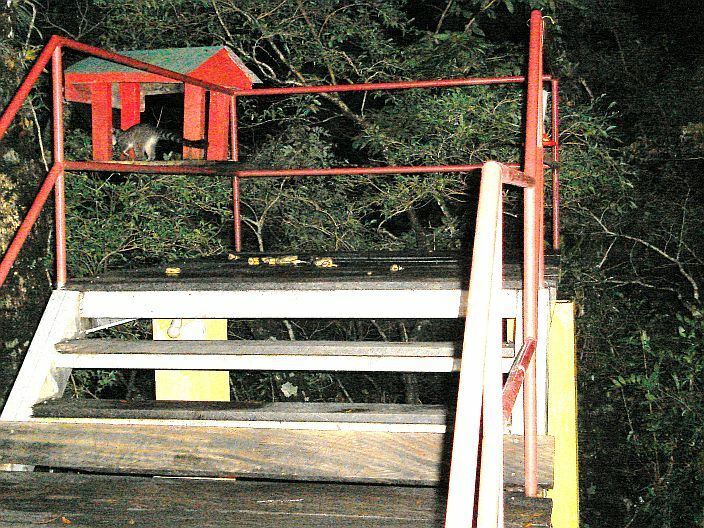 At night, nocturnal animals sometimes come to a feeding platform. If it’s raining (quite often) you can hang out in the game room to read or rent a dvd. The place is also kept clean and well-maintained by Andrew- on site most of the time. I got fewer photos than I had hoped for but not due to a lack of birds. 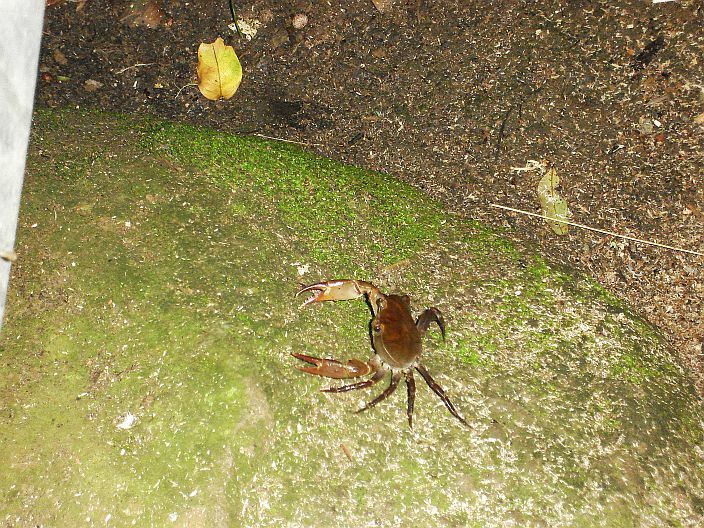 Photos were tough because my equipment wasn’t quite adequate for the low-light conditions prevalent in cloud forest. That and because birds are for the most part impatient and love to fly away just as you get them into focus; camera shy or unfriendly- you decide. 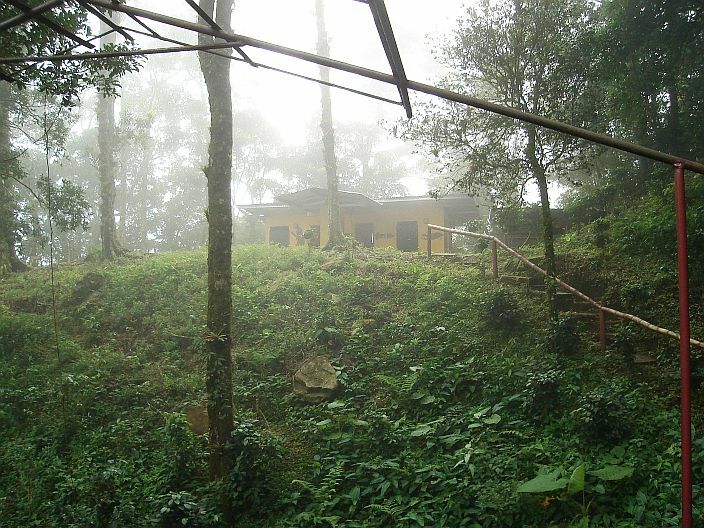 The Lost and Found eco-hostel is perfect for travelers looking for very affordable lodging within a natural setting; an escape of sorts. It’s also an excellent option for field courses and research. 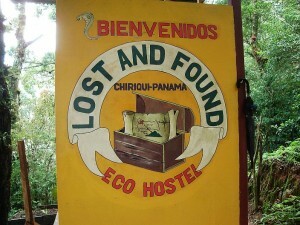 The Lost and Found is probably one of the only cloud forest hostels in the world, and I look forward to my next stay. Very buggy during the rainy season; mosquitoes, black flies and horse flies must die! The yellow sign you don’t want to miss. Another yellow sign welcoming visitors at the hostel; the cobra makes it cool! The central dining, kitchen, hang-out area. You can enjoy a coffee with beautiful mountain scenery. 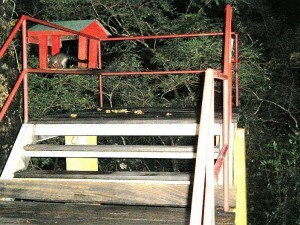 Here is a Ringtail scurrying away from the feeding platform. Its so wet that land crabs live here! Lost and Found in the mist. we are Louise (Biologist, with special knowledge about fishing and tropical botanics, speaking german, english, french, spanish) and Chris (Carpenter, passionated angler, speaking english) from Germany. 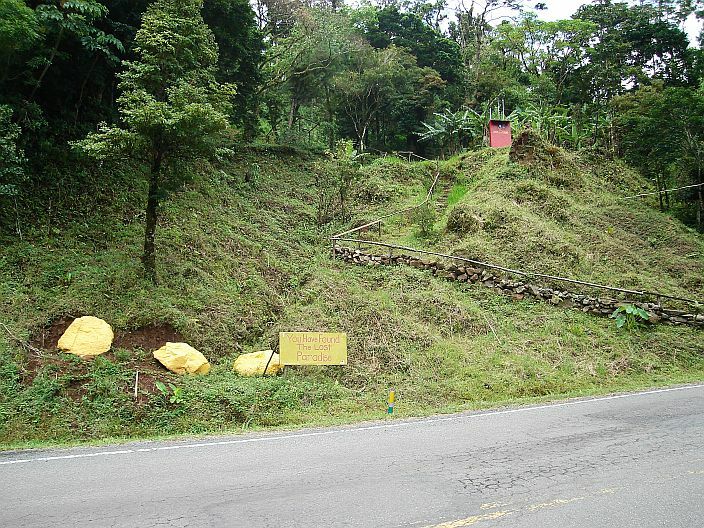 We want to move to Panamá in August ´12. We heard about the possibilities to help out in a travellers hostel in Panamá. Is there a chance to join your team a couple and help in general work at the Hostel for a couple of month as volunteers, in exchange for free dorm and meal. We are also friendly and open minded. That was a great post about the lost n found. I hope the author returns sometime, since a lot has changed at the cloud forest hostel that is located between David and Bocas Del Toro. We do accept volunteers. We offer good perks for people that want to stay a long time at our hostel. @Andrew- Thanks for the update! I hope to get back some day. Has to be one of the best nature-themed hostels on the planet. 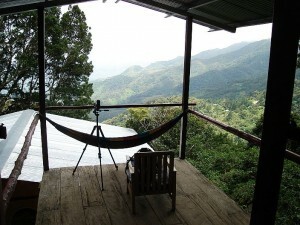 Can’t recommend it enough to hostel-staying birders visiting Panama. Hi Andrew…its Carolyne from David…I was hoping you still had the eco backpackers resort..how are things going and did you finally get things cleared.. I will have to come and visit again..it was such a beautiful place to see..you put so much effort into this..glad to see it does still exsist..